Known for providing excellent care to their patients and professionals ACTO and PPH is partnering with ORCHA to deliver online health apps to support mental health across the UK by creating a health app library and enabling professionals to find and prescribe the best apps to their clients. One in three people in the UK now experience a mental health condition and with Nine in ten people now owning a mobile phone; getting the best health app solutions to people couldn’t be more important. ORCHA - one of the innovations currently being supported by the national NHS Innovation Accelerator (NIA) - have developed an online library of health apps to safeguard Professionals, patients and citizens from using harmful apps and use good apps to support their mental health and wellbeing. The featured apps have been evaluated and reviewed based on current standards regulations and best practice including FDA standards, NHS Digital DAQ process and NHS Digital recommendations. Those that are safe, effective and tackle health conditions common amongst children, from nutrition and mental health to oral health are promoted. 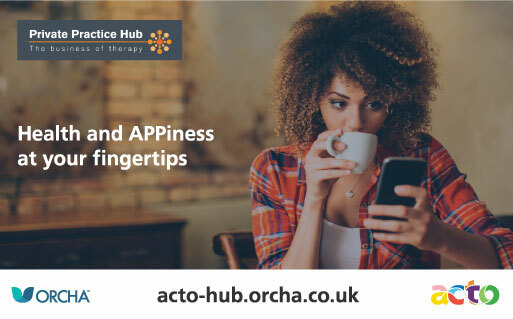 As ACTO members, as well as having open access to viewing all the apps on the ORCHA site, you’ll have your own access where you’ll be able to go and select suitable apps to recommend to your clients for use on their phone which will support people to monitor and manage their mental health in between professional care. As part of the NIA – an NHS England initiative delivered in partnership with the country’s 15 Academic Health Science Networks (AHSNs), ORCHA is being supported to accelerate the uptake of its service across England. Commenting on the work, Laura Boyd, national programme lead for the NIA, said: “This simple yet innovative approach, utilises technology to engage people with health, and it works. The library cuts through the app store noise of more than 325,000 apps and helps you to safely find the right ones for you or your patients”. Geoff Simons from Private Practice Hub, which includes the Online Therapy Hub” said “This new three way partnership is going to benefit so many therapists, not only those working online as of course these tools are equally valuable for those in face to face practice”. ORCHA is the UK’s leading health app evaluation and advisor organisation. Its unique methodology helps it to evaluate more health apps than any other organisation, include criteria set out by regulatory bodies across the world, including the FDA, the NHS Digital DAQ process and NHS Digital recommendations. Results are stores in an intelligent library, which aids finding and comparing apps across hundreds of health conditions. PPH aims to help therapists to develop a more successful therapy business, and online therapy practices, through the Online Therapy Hub. Private Practice Hub has the resources, advice and solutions you need to be successful.